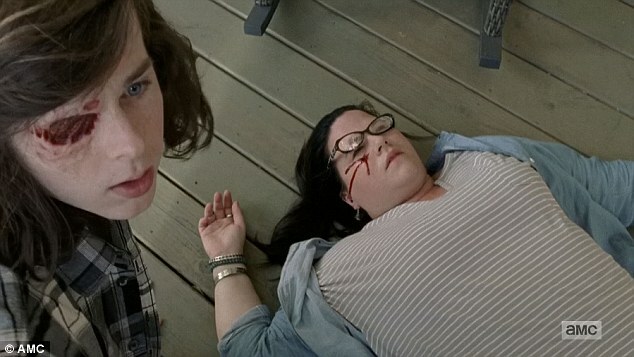 The Walking Dead finished the first half of its seventh season on Sunday by killing off two more characters in a violent and bloody send-off. 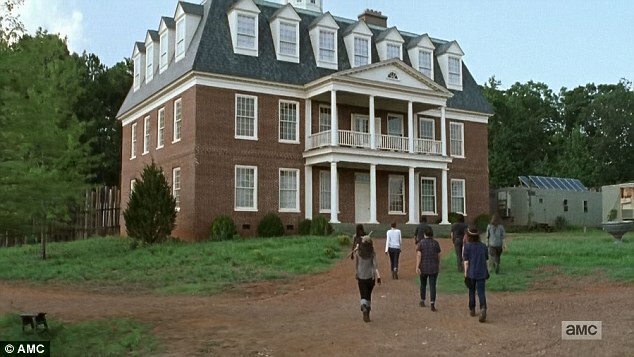 The 90-minute midseason finale saw two members of Rick's Alexandria Safe Zone - Spencer Monroe and Olivia die at the hands of ruthless Negan and his gang of thugs. 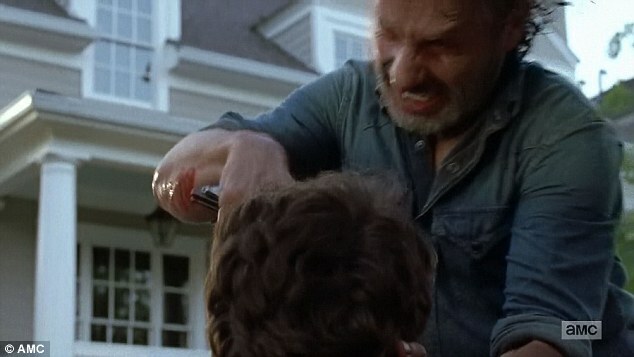 Negan, who was in Alexandria after bringing Carl back, murdered Spencer after he tried to convince him to eliminate Rick and put him in charge of the town. 'I get what you are trying to build, I am not saying I agree with your methods. It makes sense. 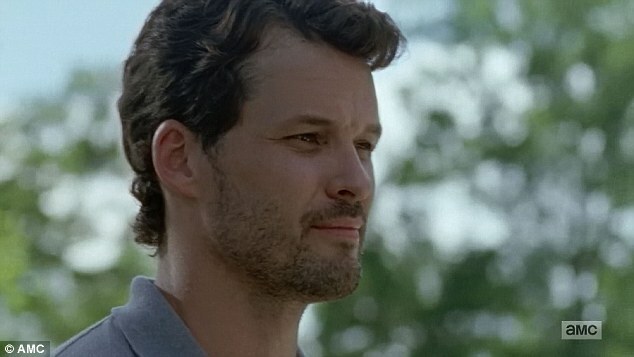 You should know Rick Grimes has a history of not working well with others,' said Spencer, whose family set-up the safe zone. 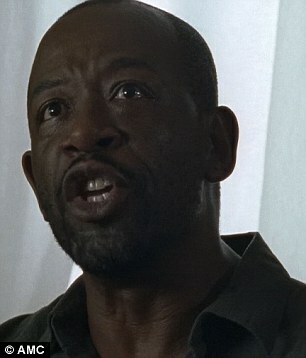 'Everything was peachy for years and then Rick shows up and suddenly you're an orphan, that is the saddest story I have ever heard. 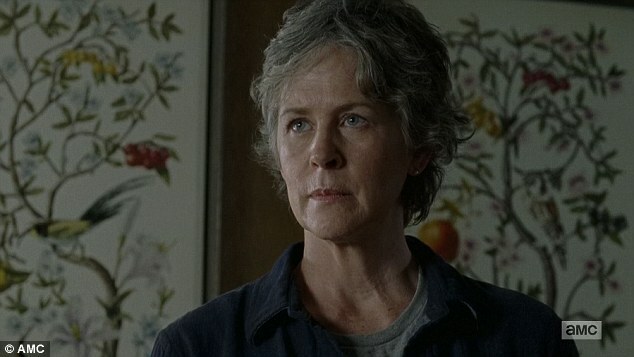 It's a good job for you that he is not in charge any more,' replied Negan. But Spencer continued to press Negan as he proposed himself as the new leader of Alexandria. 'That is what this place needs, this is what you need. 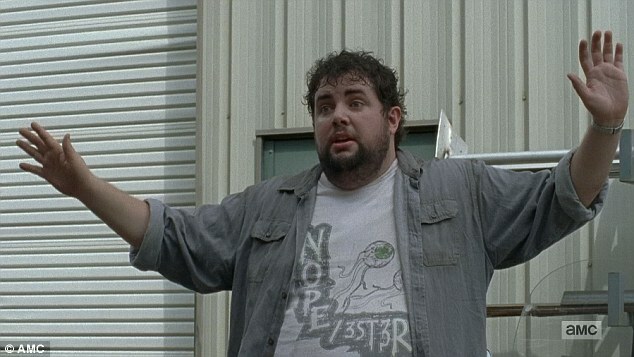 We would be much better off,' Spencer told Negan. 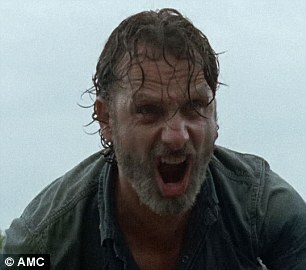 Negan told him that Rick was in fact out working for him to protect the people he loved. 'He is swallowing his hate and getting s*** done. 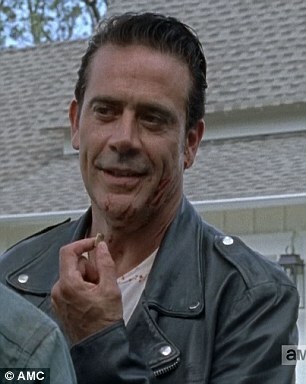 That takes guts,' said Negan. 'And then there's you, the guy who waited for Rick to be gone to sneak over and talk to me to do his dirty work so he can take Rick's place. If you want to take over, why not just kill Rick yourself and just take over? 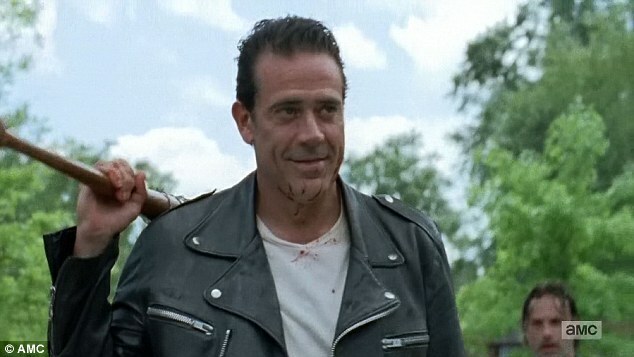 You know what I'm thinking, it's because you got no guts,' Negan told him. 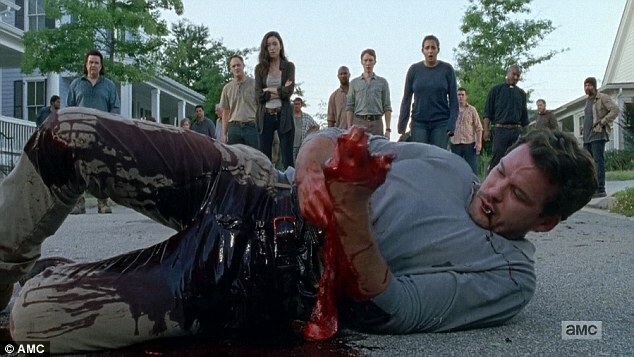 Negan then turned on the traitor by stabbing him with his knife and cutting open his stomach for everyone to see. 'How embarrassing, they were inside you the whole time. You did have guts. 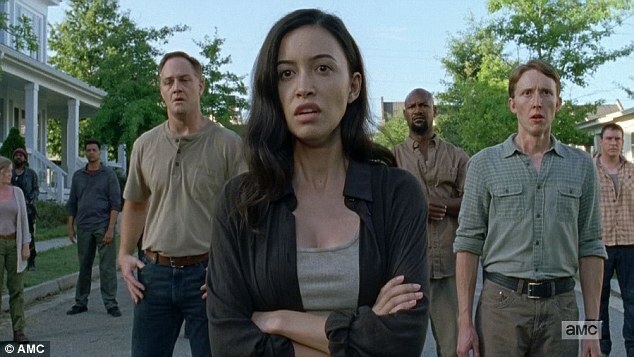 I have never been so wrong in my whole life,' said Negan coldly. 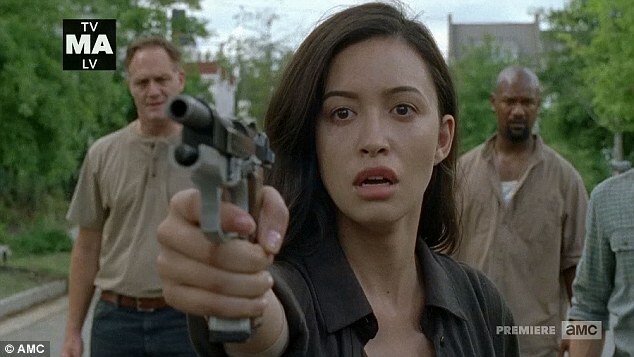 After Spencer's death Rosita was so enraged she tried to use the single bullet made for her by Eugene to take out Negan. But instead her shot struck his infamous bat, Lucille, and in retribution Negan had one of the Saviors kill Olivia by shooting her in the face. 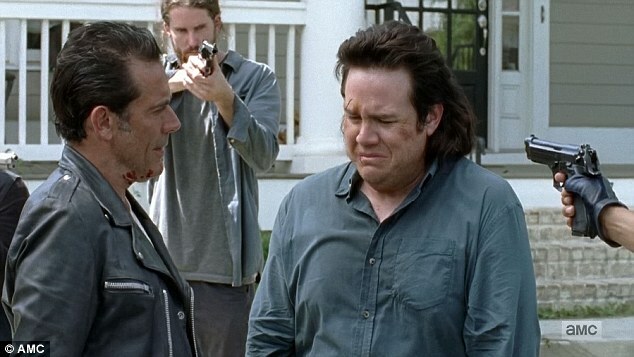 When Eugene told him that he made the bullet, Negan took him back with him to the Sanctuary. 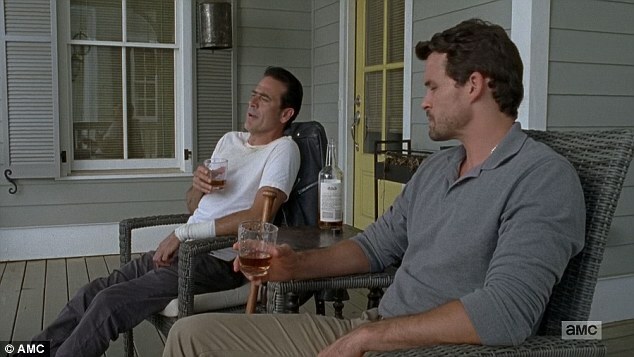 Negan shaved off his beard and cooked food while Rick and Aaron were out on their mission. 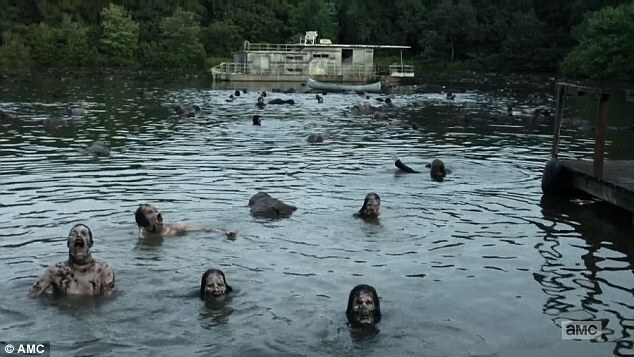 The pair had to grab a boat riddled with bullet holes to cross a walker-infested lake. Rick told Aaron he could sit it out but he refused. 'I am seeing this through, we both are,' he said. Morgan arrived at Carol's with a bag of fresh fruit but she did not want his gifts. 'Apparently some people are having a hard time believing me when I say I just want to be left alone,' Carol told him after asking how he was. 'I think you're going soft,' he told her. 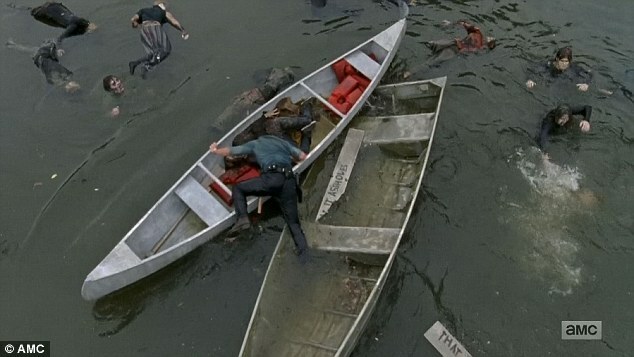 Rick and Aaron fought off walkers as their boat took on water during the hazardous crossing and they managed to make it to a canoe just in time. 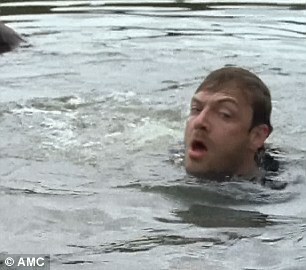 But the walkers struck and Aaron was pulled into the water where he disappeared from view for several minutes before emerging unscathed. When they reached the other side they managed to find food and weapons, but it became clear that the pair were being followed by a mysterious character, shown only by their boots. 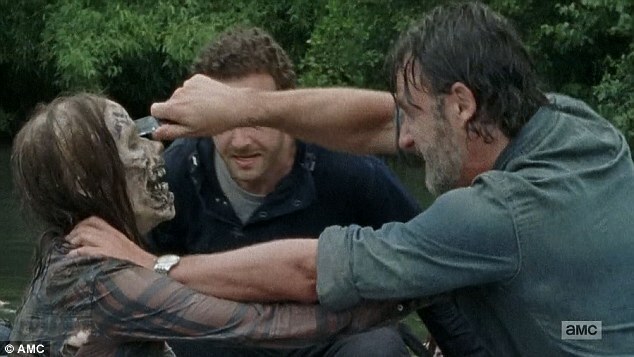 Rick told Aaron that doing what they were doing was a difficult choice and that some people disagreed with them. 'Either your heart's beating or it isn't. Either your loved ones hearts are beating or they aren't, we take what they give us so that we can live,' said Aaron. The cameras then cut to a set of mysterious boots as it was clear the two men were being watched from across the water. 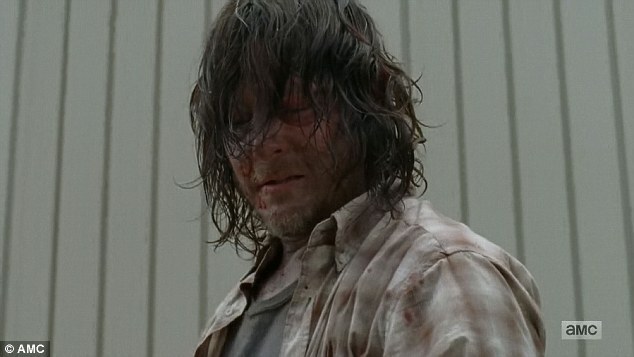 Back in his prison, Daryl managed to escape his cell and found food and clothing before beating a guard to death and making his escape. The pair were then asked to talk to Ezekiel and convince him to strike at The Saviors first to destroy them. 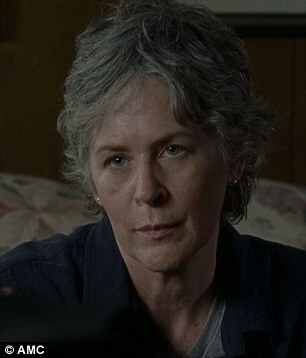 'No this is something I am not a part of,' said Carol as she refused to fight. 'I don't want anything to do with your lives or your deaths. I just want to be left alone,' Carol said. 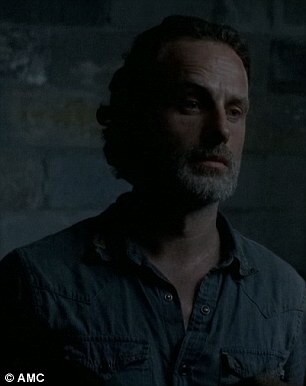 After Negan's murders, Rick arrived back on the scene and confronted the killer who told him he should be grateful for what he had done before leaving with Eugene. 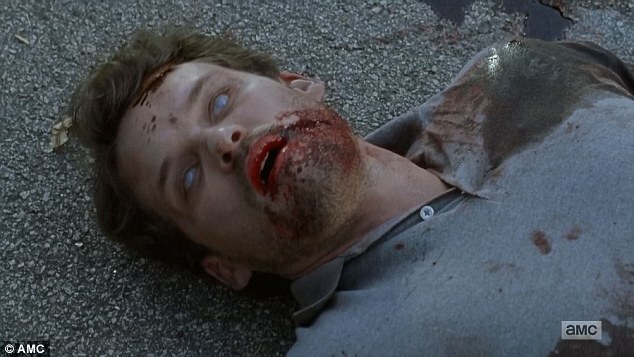 As Spencer came back to life as a zombie, Rick killed him off before meeting up with Michonne who told him that they had to be the ones who fight Negan. 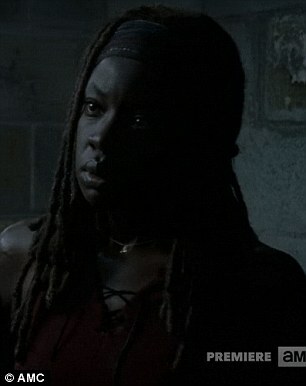 Right at the end of the show Rick and Michonne met Maggie by the watchtower of the Hilltop community. 'You were right, right form the start. You told us to get ready to fight. I didn't listen, I couldn't, but I can now,' said Rick. 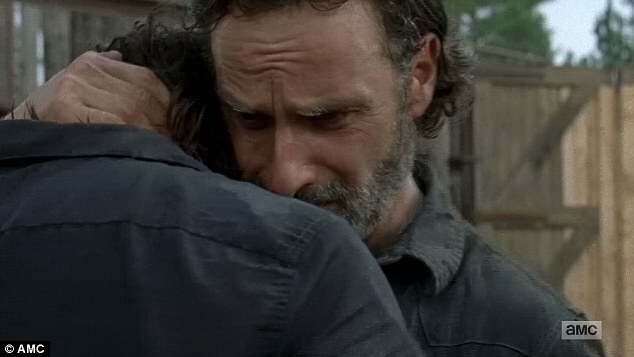 And with that Daryl walked into view and the two old friends hugged. 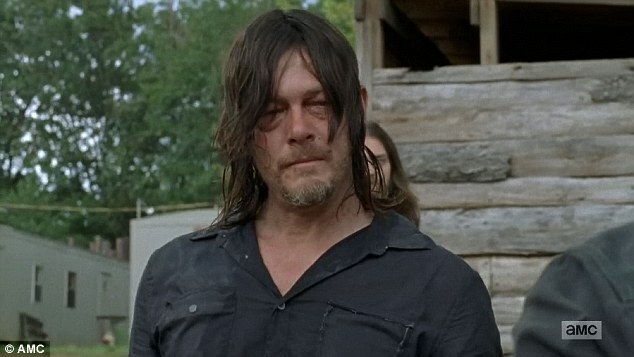 Daryl then handed Rick back his old gun that he took from the Savior while escaping and the group walked together to the nearby house in unison. 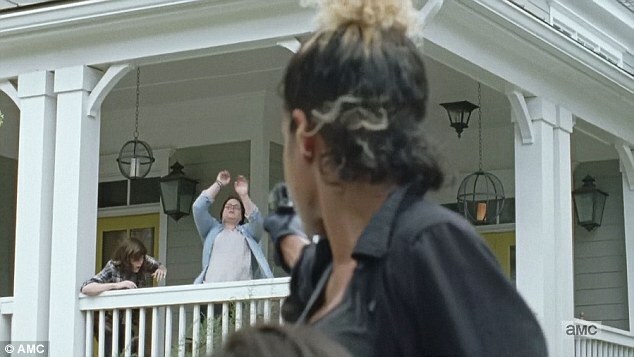 The show ended with the mystery figure who had followed Rick watching the group with binoculars from the woods before heading toward the gates. 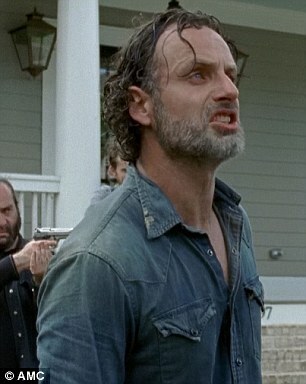 In scenes from the second half of the season Rick appears to be rallying Alexandria, Hilltop and the Kingdom together against Negan. 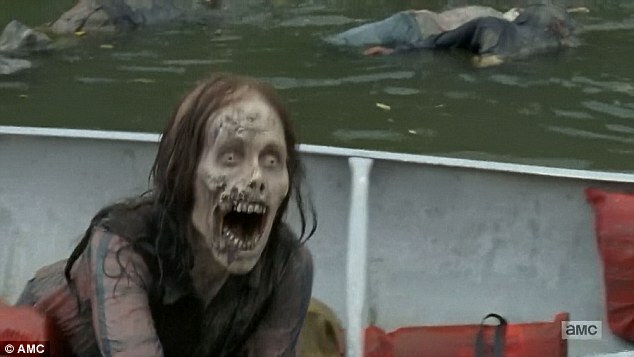 The Walking Dead returns again in February.